Two couples decide to go camping for the weekend at a music festival but on their way they stop off at a town in rural Ireland. Feeling their presence is unwelcome by the locals at the pub they leave and continue their journey. 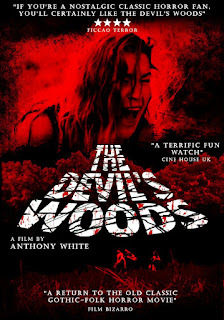 They were right about the locals as what these four friends don't realise is the town harbors a dark secret and soon they will become part of that secret in 'THE DEVIL'S WOODS'. 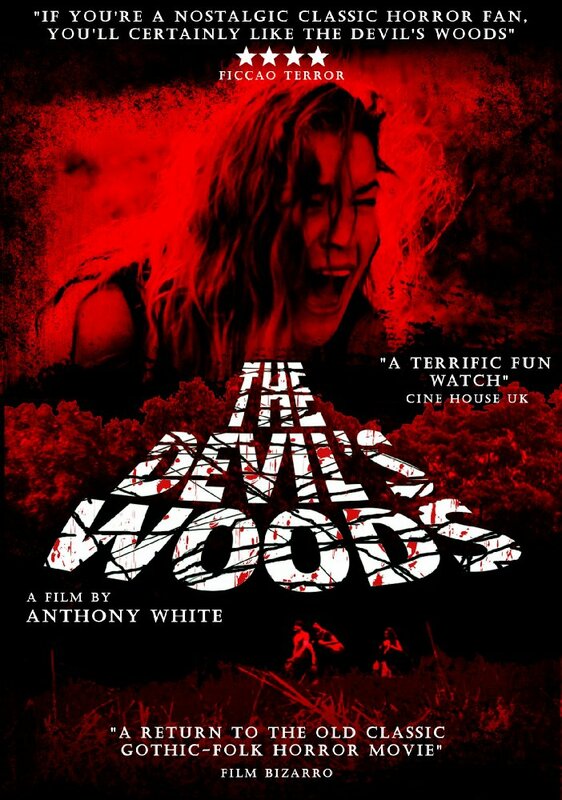 Director Anthony White has crafted a film that will appease fans of many sub-genres in the horror community. Part slasher, part witchcraft mystery thrown in a melting pot of 70's/80's nostalgia. The characters are well written and have just enough dialogue to keep you hooked and not have you thinking what on earth are they talking about. Where the film falters is the story where we get told of the legend of the hell fire club and they come across the ruins of an old castle where the supposed club did disturbing things. Unfortunately after this mention of the club nothing comes of it until the final moments of the film. There is a slight air of mystery surrounding the locals as well, are they a new breed of the hell fire club or are they just disturbed individuals? You can't help but see the obvious references throughout from 'THE BLOOD ON SATAN'S CLAW', 'THE WICKER MAN' and other British folk horror movies. A nice addition to the British wave of folk horror that at 73 minutes long goes by quickly and doesn't out stay its welcome.